February 2, 2016, 10:27 AM · I recently read a conversation with some adult starters about playing with an orchestra/ ensemble, etc., and what the motivations are, both for and against. A number of individuals had joined groups that were somewhat above their existing ability level. They found that in spite of the fact that they had difficulty keeping up, following along, or keeping time, they leveled up in ability. I noticed that because so many people mentioned that the experience of playing with better people made you better, it caused some of the less experienced in the conversation to decide that either they needed to avoid playing with a group altogether because they didn’t want to be that stressed out, or even that they wouldn’t bother to play with a group that they felt was below their level. It’s too bad. If you have never played with a group of other people before, there’s something to be said for playing music that seems easy to you. Playing with others involves so many things beyond the reading the score, that removing the obstacle of music beyond your skill level allows a person to really focus on learning group playing skills. I admire folks that have joined groups that are more advanced as first timers, but it must introduce a huge amount of additional frustration. While I wish I had the opportunity to play more advanced music, I am content to play in my little beginner’s ensemble for now. The environment is relaxed, and focused on education. It’s nice that we get direction on how to follow the conductor, what to listen for, and when to watch the other players. 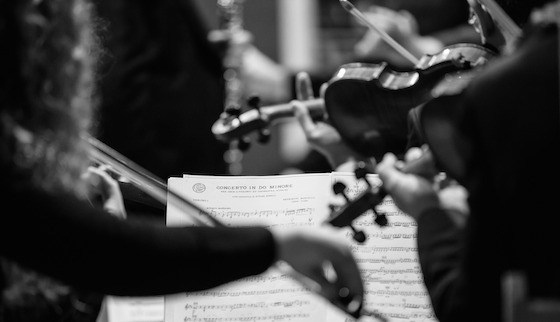 It’s interesting to note the different attitudes between those who are inexperienced with organized playing, and those who have played in ensembles/orchestras in the past. Sometimes we get ringers in to fill out a section, and observing them can be educational too. If you are passing on opportunities to play with others because you feel the level of music is beneath you, please reconsider. There are other things to discover. Letting go of the music may give you the freedom to grow in other aspects of ensemble playing. After all, aren’t we amateurs entitled to enjoy what we have accomplished? What’s more enjoyable than sharing music, no matter how simple? February 3, 2016 at 09:52 PM · There are multiple avenues to getting ensemble experience. I play chamber music with an amateur violist. She was an experienced flautist but switched to viola as an adult. She started playing in orchestras that were initially too advanced for her, but was welcomed to sit in the back of the section and play what she could, even if it was only one note per bar. She made very quick progress and today plays in high-level nonprofessional ensembles. I was in the “extended break from playing” category a few years ago and did this program for a few months. It was just the ticket for me to get back to music. February 4, 2016 at 01:17 AM · Just over a year ago, I joined a civic orchestra that was too advanced for me, but I worked extremely hard every day and played whatever I could manage during rehearsals. It would take hours poring over the entire score before I could understand my place in the music. I have advanced far beyond what I ever expected in such a short time. Sight reading is much easier, I am playing more frequently in higher positions, I don't panic when I come across bars of music crammed with accidentals. As the months go by, I find that I can relax and not work so relentlessly. With each concert, I am able to contribute more fully to the orchestra. I almost gave up several times during my first season but I am so glad I stuck with it. The experience is immensely rewarding. February 4, 2016 at 10:29 PM · I'm currently stretching myself in both directions from the orchestra I normally play in. I've been invited to play in a more advanced orchestra that's short of violas for an upcoming concert. This is the second time I've done this - they invited me into a concert last year as well - and it does make me work hard to keep up, but the music is amazing. I couldn't do it on a regular basis, though - two orchestras at once is a bit too much, especially since both rehearsals are on the same day. On the other end, I'm also in a chamber group with people who are generally less advanced. It's still a good exercise in working together, though - and I find myself developing the skills to keep other people in line and bring them along. I'm also learning that everyone, regardless of level, has something to contribute, and that chamber music is a process of give and take. It's true that playing with people better than you is a good experience. But playing with just about anyone, regardless of level, has its benefits. If for no other reason, consider playing with less advanced musicians as a way of paying it forward from the people who helped you advance. February 5, 2016 at 02:23 AM · When I re-started viola after a 25+ year hiatus I joined a community orchestra and struggled to keep up. I was amazed at the encouragement I was given by those who were more experienced and knowledgable of the repetoire than I was at the time and never understood why I was on the receiving end of their patience and support. I play mostly in chamber groups now with people at close to my level, but also fairly frequently with those who are just starting or starting back up again. My first experience of playing with a group well below my level of playing was first faced with alot of trepidation, but I quickly discovered that it was a tremendous learning experience for me - how to count out loud and play at the same time! I never learned how to do it before then. Previous attempts were disastrous. I'd either stop counting or playing or worse - a weird combination of both. Now I can do it consistantly as long as the music isn't overly challenging. This skill has helped me as a musician in so many ways I can't even begin to list them. I know why now... Helping others helps yourself. And besides, its all about the profound experience that only making music with another person can offer. February 5, 2016 at 03:25 PM · I have fond memories of playing in many orchestras and quartets in my youth. While I don't have time right now to commit to a regular orchestra due to life getting in the way, as an amateur I'm very fortunate that my Church has an excellent music ministry, where I've been able to volunteer as 1st violin (last chair) amongst professional musicians for major choral performances offered once or twice a year and featuring a full orchestra (and phenomenal soloists from opera companies). There is no question that playing in an orchestra with superior players dramatically improves one's musicianship. Despite the weeks of practicing beforehand with headphones playing the music, I'm constantly amazed how my awareness and focus intensifies once the baton is raised (I WILL not make that mistake on the off-beat for all to hear!). The thrill when I can play with confidence a particularly difficult passage with the pro's is addictive, and the ecstasy I feel as the orchestra reaches a climactic finale in union with the chorus is unforgettable. Over the years we've played many epic oratorios that have provided such a joyful experience, including: Requiems by Mozart, Rutter, and Durufle; Beethoven's Christus am Olberge; Berlioz Infancy of Christ; Haydn's Creation; Johengen's Veni, Creator Spiritus; Mozart's Mass in C; Rutter's Magnificat; Vivaldi's Gloria; and, of course, Handel's Messiah. Tonight we're performing Handel's Joshua. I can't wait! February 9, 2016 at 03:59 PM · This resonates with me. I did my first playing in elementary school but didn't get any orchestra experience till I entered high school. I was the youngest member of the ensemble and felt like the little kid crashing the big kids' party, since most other players were juniors and seniors. It was an adjustment at first, but I adapted and found myself moving up through the ranks pretty fast -- or, rather, getting pushed up through the ranks. My childhood dream of becoming a professional symphony player motivated me to take up violin. After high school, I went on to do some heavy-duty training for this profession during my degree program -- although I finally decided, at 21, that the music business wasn't where I wanted to go after all. I also realized by then that chamber playing, typically in groups of four or five people, one player to a part, suited me better. Still, I wouldn't have wanted to miss the orchestra experience I got. It definitely expanded my horizons and showed me I was capable of more than I'd previously thought.